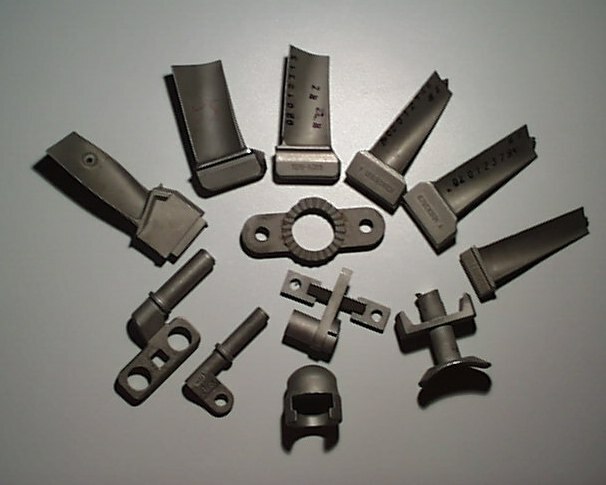 turbine blade, nozzle guide vane are our main vacuum investment castings. The material of those turbine blade made by SIMIS is nickel-based superalloy at present. In terms of the features of those investment casts, they have to be casted through vacuum furnace. The length of our smallest turbine blade is 40mm and the thinnest thickness can be 0.5mm; the length of the largest one is about 500mm and the weight can be 13kg. Equipped with vacuum furnaces, vacuum quenching furnace and fluorescence detection , and so on, SIMIS can produce most kinds of blades with the superalloy material used in gas turbine and nozzle. A turbine blade is the individual component which makes up the turbine section of a gas turbine. The blades are responsible for extracting energy from the high temperature, high pressure gas produced by the combustor. The turbine blades are often the limiting component of gas turbines. To survive in this difficult environment, turbine blades often use exotic materials like superalloys and many different methods of cooling, such as internal air channels, boundary layer cooling, and thermal barrier coatings. In a gas turbine engine, a single turbine section is made up of a disk or hub that holds many turbine blades. That turbine section is connected to a compressor section via a shaft (or "spool"), and that compressor section can either be axial or centrifugal. Air is compressed, raising the pressure and temperature, through the compressor stages of the engine. The temperature is then greatly increased by combustion of fuel inside the combustor, which sits between the compressor stages and the turbine stages. The high temperature and high pressure exhaust gases then pass through the turbine stages. The turbine stages extract energy from this flow, lowering the pressure and temperature of the air and transfer the kinetic energy to the compressor stages along the spool. This process is very similar to how an axial compressor works, only in reverse. The number of turbine stages varies in different types of engines, with high bypass ratio engines tending to have the most turbine stages. The number of turbine stages can have a great effect on how the turbine blades are designed for each stage. Many gas turbine engines are twin spool designs, meaning that there is a high pressure spool and a low pressure spool. Other gas turbines use three spools, adding an intermediate pressure spool between the high and low pressure spool. The high pressure turbine is exposed to the hottest, highest pressure air, and the low pressure turbine is subjected to cooler, lower pressure air. The difference in conditions leads to the design of high pressure and low pressure turbine blades that are significantly different in material and cooling choices even though the aerodynamic and thermodynamic principles are the same. turbine blades are subjected to stress from centrifugal force (turbine stages can rotate at tens of thousands of revolutions per minute (RPM)) and fluid forces that can cause fracture, yielding, or creep failures. Additionally, the first stage (the stage directly following the combustor) of a modern turbine faces temperatures around 2,500 °F (1,370 °C) up from temperatures around 1,500 °F (820 °C) in early gas turbines. Modern military jet engines, like the Snecma M88, can see turbine temperatures of 2,900 °F (1,590 °C). Those high temperatures weaken the blades and make them more susceptible to creep failures. The high temperatures can also make the blades susceptible to corrosion failures. Finally, vibrations from the engine and the turbine itself) can cause fatigue failures. The development of superalloys in the 1940s and new processing methods such as vacuum induction melting in the 1950s greatly increased the temperature capability of turbine blades. Further processing methods like hot isostatic pressingimproved the alloys used for turbine blades and increased turbine blade performance. Modern turbine blades often use nickel-based superalloys that incorporate chromium, cobalt, and rhenium. Aside from alloy improvements, a major breakthrough was the development of directional solidification(DS) and single crystal (SC) production methods. These methods help greatly increase strength against fatigue and creep by aligning grain boundaries in one direction (DS) or by eliminating grain boundaries all together (SC). 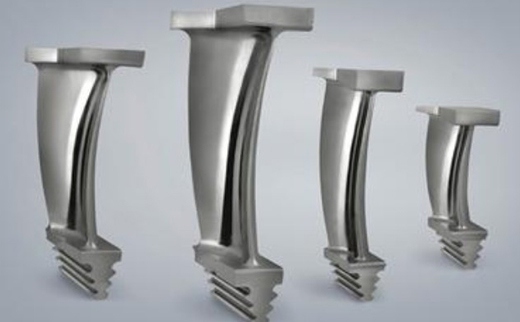 Most turbine blades are manufactured by investment casting (or lost-wax casting processing). This process involves making a precise negative die of the blade shape that is filled with wax to form the blade shape. If the blade is hollow (i.e., it has internal cooling passages), a ceramic core in the shape of the passage is inserted into the middle. The wax blade is coated with a heat-resistant material to make a shell, and then that shell is filled with the blade alloy. This step can be more complicated for DS or SC materials, but the process is similar. If there is a ceramic core in the middle of the blade, it is dissolved in a solution that leaves the blade hollow. The blades are coated with the TBC they will have, and then cooling holes are machined as needed, creating a complete turbine blade. IN-738GE used IN-738 as a first stage blade material from 1971 until 1984, when it was replaced by GTD-111. It is now used as a second stage material. It was specifically designed for land-based turbines rather than aircraft gas turbines.